North Cyprus is one of Europe's top holiday destination this year thanks to the Turkish lira exchange rate, and most visitors stay in hotel in Kyrenia, a pretty coastal town. The sheer range of Kyrenia hotels on offer can be bewildering if you've never had a holiday in North Cyprus before, so here's our guide to help you choose a central Kyrenia hotel or other North Cyprus hotels. North Cyprus has miles of unspoiled coastline with dozens of beaches, but very few Kyrenia hotels have a sandy beach of their own and none have one as gorgeous as the Acapulco Beach Club Hotel. The Acapulco Beach Club Hotel work hard to make their beach as irresistible as possible, with clean golden sand lapped by the warm Mediterranean Sea, plenty of sun-loungers and parasols, a beach bar, showers, water sports, the list is endless. As a guest of the Acapulco Beach Club Hotel, one of the best Kyrenia Cyprus hotels, you can use the beach for free all day, every day, for as long as the barman is serving and beyond! From the generous buffet breakfast to a delicious dinner at night, from cool drinks on the beach to a bottle of local wine at night, the Acapulco Beach Club & Resort Hotel staff look after your every need. The enormous swimming pool is the biggest in North Cyprus, ideal for a cooling dip, and children will adore the waterslides of their own mini Aqua Park onsite. 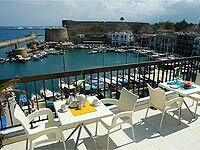 For sheer value for money in North Cyprus Kyrenia hotels, it's hard to beat the Malpas Hotel. 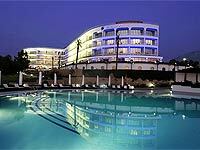 Many guests love this Kyrenia hotel so much, they come back year after year! The Malpas Hotel has everything you'd want from a Northern Cyprus holiday, from your lovely spacious room with a sea view, to a picturesque swimming pool, and choice of bars. The Malpas Hotel has its own private beach, exclusive to hotel residents, and you don't even have to walk to this North Cyprus beach, the Malpas Hotel provides a shuttle bus! What makes the Malpas Hotel Cyprus such exceptional value, apart from the high standard of rooms and the superb service, is the current offer of a FREE upgrade to half board by our sponsored travel agent. The Malpas Hotel is well-known for its excellent food, from the cosmopolitan buffet breakfasts to the a la carte dining options in the La Broche restaurant and a la carte lunch at the new Cornaro beach restaurant. Life in Kyrenia town has always focused around its picturesque harbour, dating from Venetian times, and the Dome Hotel in Kyrenia is literally just a step away from the boats bobbing on the waves. The Dome Hotel has been the queen of Kyrenia hotels since the British administration, and retains its feeling of old-world charm combined with impeccable service. As if being in the heart of Kyrenia was not enough, the Dome Hotel sits on its own rocky promontory, where you can wander out to the natural rock pools for a swim, or just watch the sunset over a delicious cocktail. 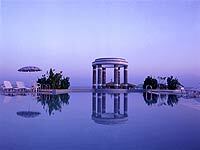 Amongst all Kyrenia hotels, The Dome offers you both an unbeatable location in town and the feeling of a seaside hotel. How can you resist?! 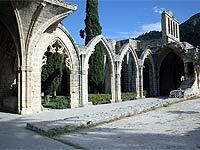 Many a hotel in Kyrenia would fight for this title, but in our view there's one clear winner - the Bellapais Monastery Village. With views down the mountain to Kyrenia and the coast, in an area of outstanding natural beauty within the shadow of the ruined 12th century Abbey above, the Bellapais Monastery Village Hotel is an oasis of calm and relaxation. Soak up the sunshine on the terrace, take a dip in one of the two crystal clear swimming pools, or just marvel at the view. Indulge in a muscle-soothing massage before lunch, then snooze the afternoon away amongst the trees. No day at the Bellapais Monastery Village is complete without dinner under the stars on the restaurant terrace, with the lights of Kyrenia twinkling below and the sun setting over the Mediterranean Sea. Bliss! In these credit-crunch days, it's good to know you can find great little hotels in Kyrenia which won't bust your budget. The British Hotel is our favorite budget hotel in North Cyprus, because it's right in the heart of Kyrenia, with amazing views from any third floor room balcony over the harbour below. Stroll out the door of the British Hotel, down a pretty cobbled side street and there is the harbour, lined with cafés, restaurants and shops. With just 19 rooms, the British Hotel is a cheap Kyrenia hotel with clean, tidy rooms, an excellent buffet breakfast, and a bar with great views. What more could you ask for?